Geodesic Temple is Disorient's interpretation of an ancient gathering space. Geodesic Temple is a new language with a one-word vocabulary (octahedron) and a grammar (octahedra connection) with which new meanings can be constructed. It is a modular structure--composed of human sized octahedra--that rises above the playa and provides a beacon for community. From a distance the Temple seems complex, but the viewer encounters a fundamental shift upon discovering the simplicity of the components. This challenge to expectation inspires, opens the mind, embodies the Burning Man spirit and acts as a Rite of Passage. Geodesic Temple is a modular structure--composed entirely of human sized octahedra--that rises and seemingly floats above the playa surface providing an awe-inspiring beacon for all members of the Burning Man community and a powerful haven for those seeking to create, or participate in transformative ritual experiences. As detailed below, the design of Geodesic Temple uses the octahedron (double pyramid) as a modular building block to create a highly innovative, self-supporting structure. The octahedron was intentionally chosen as the atomic unit of Geodesic Temple because of its meaning and significance as one of the five platonic solids, which have been used for eons in sacred geometry and spiritual architecture. According to various esoteric traditions, each of the five platonic solids carries special teachings. The octahedron, also known as “the seed of life,” is symbolic of the union of heaven and earth, which exists within each of us. It also represents the Heart Chakra, serving as an expression of self-love and compassion. The octahedron is connected with the element of Air, which represents consciousness, the breath of life, and new beginnings. From this rich symbolic basis, Geodesic Temple derives a special power to enable profound personal realizations and transformative collective experiences. From a distance, the Temple seems complex, but as the viewer comes closer, she encounters a fundamental shift of awareness upon discovering the simplicity of the components. This shift of awareness serves to challenge expectations, opening the heart and mind to infinite new possibilities, thereby embodying the Burning Man spirit and acting as a Rite of Passage, in and of itself. 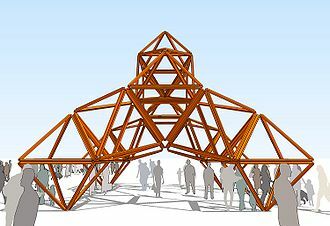 Geodesic Temple is the most ambitious project attempted by Disorient in its 11 years of existence. One of the strengths of Disorient is its community and the tight connections that bind its members. Its base of veteran burners has welcomed newcomers for the past decade, many of which are now part of the core group of DOers (Disorienters). Disorient is always open and welcoming to newbies. 230 DOers camped at Disorient in 2010 and about 2000 more since its inception. Geodesic Temple is a new direction for Disorient. We are able to build this piece thanks to the will and strength of hundreds of DOers. Geodesic Temple is a meta-modular, self-supporting, burnable structure made of octahedra, a regular polyhedron with 8 identical equilateral triangular faces which is also a geodesic volume and a platonic solid. The octahedron is used as building block to create a self-supporting structure meaning that the resulting architecture does not have a frame onto which other elements such as facades are added. In that sense, it is about transparency and truth. All octahedra have similar sizes and are made of 2x4 struts. The choice of using the octahedron as the basic module of Geodesic Temple was dictated by the physical qualities of the octahedron. Modularity is one of the core principles of Disorient as expressed in the Disorient Model ( http://wiki.disorient.info/index.php?title=Disorient_Model ). The radically modular Geodesic Temple is no exception. Geodesic Temple is a meta-modular (modules made of modules) structure based on a single module, a octahedron. It is exclusively composed of 144 octahedra, all similar. Each octahedron is made of 24 identical 2x4 wood struts. Triangles are stronger than squares as that they are inherently triangulated. Geodesic Temple is economical because of the inherent strength of triangles; it takes less material to build a modular structure using octahedra than it would using classic orthogonal building blocks. 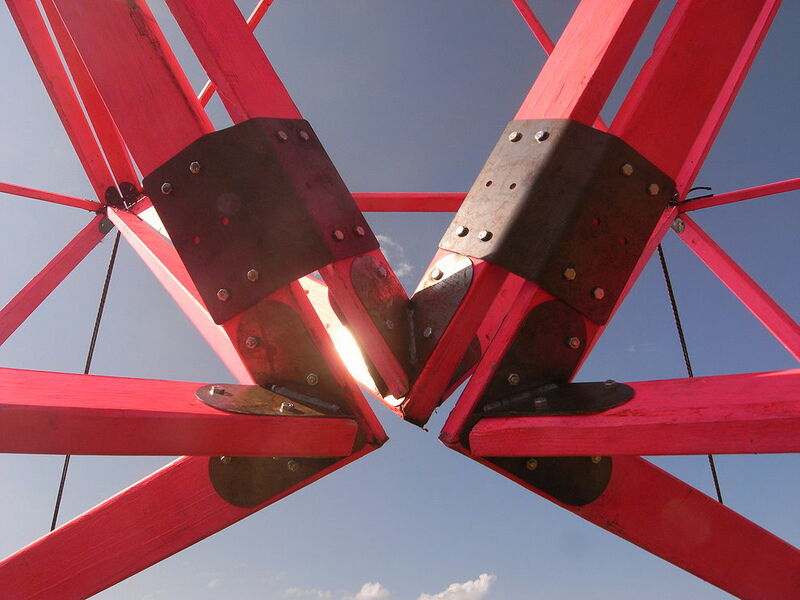 Octahedra will be assembled on site to reduce the carbon footprint of the project. Sides of octahedra can be partially or completely skinned individually. Skinning the structure with plywood or fabric would provide additional shade and help with the burn but will have to be taken into account when calculating the wind resistance. As an art collective, Disorient has created artworks recycling material from previous installations for the past 11 years and developed a decentralized approach supported by a vast vocabulary of "modules" ( http://wiki.disorient.info/index.php?title=Disorient_Model#Disorient_Module ). 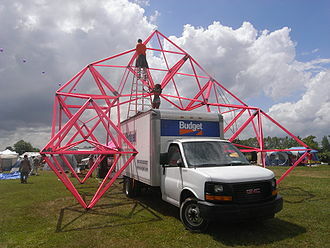 The octahedra used for Geodesic Temple will become part of Disorient's visual vocabulary and will be reused and reconfigured for future installations either as a version of Geodesic Temple or as other structures. You can see examples of several structure configurations based on the same octahedron at http://geodesictemple.com . In addition to the octahedra, any remaining tool, materials, and supplies after disassembly will be stored and reused by the art collective for future projects. We plan to obtain, to the fullest extent possible, supplies from Build It Green! NYC (BIG!NYC), Materials for the Arts and other sources of salvaged and surplus building materials. We have dedicated a team to locate recycled materials. Geodesic Temple should not be climbed on. It provides shade and a meeting place for members of the community to gather and interact with each other. Version 1.0 (Mars 2011) - Simas Connector 1.0 is made of three 1/16" steel plates welded together. 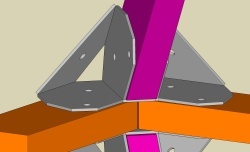 Two Simas Connectors are needed at each apex of the Octahedron (See pictures below). Holes receive 1/4"x2" bolts. Version 1.1 (April 2011) - Same as 1.0 plus 45 degree reinforcement bar on the side, between the plates. Version 2.0 (May 2011) - Based on previous versions. Increased steel thickness to 1/8". 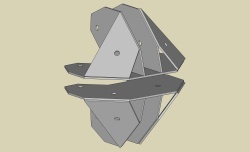 Version Alpha (April 2011): GeoTemAlpha was assembled using off the shelf metal plates screwed into the 2x4 struts. Version 1.0 (May 2011) Lowroad Connector 1.0 is made of one 1/8" steel plate bent in two places. Holes receive 1/4"x2" bolts. From the experience we have gained assembling our own geodesic domes and our expertise with large-scale inflatable structures we understand that precision is crucial at every stage of the fabrication and assembly processes when putting together large geodesic structures as any mistake will amplify down the line if not corrected immediately. 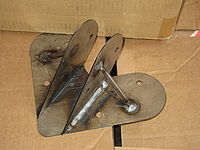 To that end we designed, fabricated and use a jig to make every element exactly the same, therefore interchangeable. 2x4 struts are cut and drilled to specs off playa at the Disorient Dock with professional equipment. Elements of GAX (over a thousand 2x4 wood struts) were prepped by Disorient Philadelphia at the Disorient Fire Dock located in their home town. We have cells dedicated to specific parts of the assembly process. The highly repetitive aspect of this construction permits members of each cell to become experts at the specific tasks that they perform which translates into a more accurate fabrication, faster assembly and a safer structure. The different steps of on-Playa assembly are performed in parallel by several cells. Create octahedra by connecting 2x4s together using the Simas Connector. 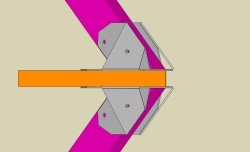 The ends of the struts that are precut at an angle to fit tightly together using the Simas Connector. Repeat the process until the octahedron is complete. Members of this cell are responsible for quality control of each octahedron. Each wood strut is carefully assessed for strength and durability. Struts that are warped, split and/or that have knots are set aside and used in related projects which require a lower level of accuracy such as Disorient camp frontage or Disorient mutant vehicle transformation. After each octahedron is assembled two members of the cell verify that each nut is tight on its bolt. This step is crucial as a lack of rigidity in one octahedron could compromise the entire structure. 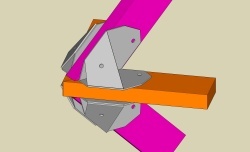 Connecting arch A and arch B together using the Lowroad Connector. This last step of GeoTem04 assembly is also known as the Click. It requires 13 people and a 10-12' tall box truck. The top of the box truck is prepped with a platform made of 3 sheets of 4'x8' 3/4" plywood screwed together to two 2x4x10' struts and secured to the box truck with ratchet straps. This platform allows a specialized cell to work on top of the truck to do the final connect. 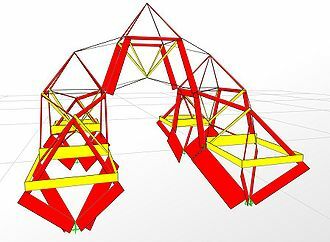 All four legs of the two arches need to be on the same plane, preferably horizontal, which means that the ground needs to be measured and possibly dug in some locations for the Click to happen smoothly. Leo Villareal and The Eye design the lighting scheme for Geodesic Temple. Muvment and Joe Cole produce the lighting solution and head installation at Burning Man. For GAX at Burning Man 2011 we used 12 sequenced ColorBlast type LED fixtures for each of the five GeoTem04. Color: Pornj (pink and orange), Disorient's color. Plus one powerful PAR can at the top of each structure. 1. Elements of New Leo Sign (2010) mounted on the struts. Color: Orange. 2. Sequenced LED modules mounted on each outside octahedron connector. 3. Strobe light inside each octahedron. 4. The Temple transforms as you view it from different angles. It transforms and disorients the eye to warp into what shape best suites the viewers perspective. What if we were to be able to control and manipulate that perspective? What if we are at times able to create different forced perspectives? One moment it's a pyramid, the next it's a series of stacked octahedron's, look again and it's a pair of giant circles. Other considerations by Joe Cole: The ColorBlast and strobe lights are punchy and provide a dramatic look - they will be the "big punchy effect" side of the piece. However to allow for singling out the shapes and controlling them we need something with more finesse: RGB LED tape. If we pick key elements of the structure and outline them with the LED tape we will be able to change and merge the colors of various connecting points to create the illusion of different geometric shapes (and change their color as we see fit). It's a big task and involves a lot of hardware but we already have most of what we need, as well as a Disorienter who happens to be a very good wholesale source for the LED tape. The 12v RGB LED tape can be used in conjunction with the controllers we used on the pixel wall at the Art Car Wash in 2010. Each board is 32 channels of single color or 10 separate controls for RGB (with a couple leftover channels). By stringing them all together using DMX we will be able to map the different segments to the console. Form the console we can pull up what we need/want when we need/want it. In this manner we will be able to pick out individual elements and adjust their color as we see fit. Another option is single color tape. Pink is easy to find but orange may be a bit of a problem. This would be less colorful, but would significantly reduce the number of control channels needed. Geodesic Temple provides shade in the day, light at night, and serves as an inspiring gathering place for members of the community any time of the day or night. It will play host to Sacred Dance, Vibrational Sound Healing, as well as spontaneous and planned ritual activities of all sizes and is also an ideal setting for individual or group meditation practice. The entire experience of visiting Geodesic Temple is interactive in that one’s proximity and position in relationship to the Temple results in a continually transforming visual experience and forming new shapes and patterns from every perspective. One moment it's a pyramid, the next it's a series of stacked octahedra. Look again and it's a pair of giant circles. As one moves around the Temple, perspectives change and the entire structure visually oscillates between order and chaos. Once inside, a sense of comfort inspires anonymous strangers to become sympathetic players. The temporary community that hatches inspires members to interact and share. Ideas are articulated, meanings emerge and a newly found sense of belonging leads to a state of flow and wellbeing, facilitating spontaneous rituals suited to the individual players and the unique collective energy arising from those present. Another key interactive and participatory element, will be daily Moop sweeps beginning at sundown, in which visitors are invited to join one of several coordinated lines spiraling outward from the center of the Temple, in a silent moving meditation focused on leaving no trace. Due to its size and complexity, Geodesic Temple is not intended for participants to climb upon. 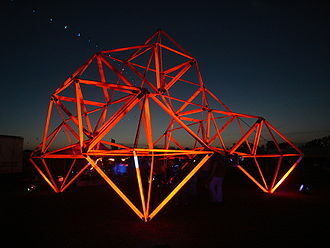 To enable safe physical interactivity, several octahedra are left free standing to be rolled around, climbed inside of, and otherwise manipulated by participants. This is intended to enable participants to gain a deeper connection with and understanding of the sacred geometry that imbues the structure. The practitioners of Sacred Dance and Vibrational Sound Healing may bring in supporting music to maximize the transformative impact of these interactive rituals. a member and researcher in Positive Psychology with the Institute for Spirituality and the Mind at the University of Pennsylvania. Accordingly, the Geodesic Temple should be placed an appropriate distance from other installations to respect their sonic landscapes. Geodesic Temple will be not be burned in 2011, but it may be burned in the future. Protecting the playa surface is a critical element of the burn plan. At the completion of the construction phase, we will place Decomposed Granite spread underneath and around the installation perimeter to protect the playa during the burn. We welcome input on the best practices for incorporating DG into the base of the installation in terms of the depth and spread of the DG. We understand that the 2x4 struts as shown on GeoTem06 may be too far apart for the fire to start and propagate well and we can think of three possible solutions to remedy this issue. 1. Add combustible material such as hemp bags 3/4 filled with hay inside the octahedra located in the lower part of the structure (show on sketch combustible material placement throughout the structure). 2. Reduce the length of the basic 2x4 strut from 8 feet to 6 or 4 feet. The design concept would remain the same but the resulting structure would have more octahedra, more levels and more wood in general to reach the same dimensions (make sketch showing structure made with octahedra using 4' and 6' 2x4s). 3. Incorporate wax and burlap bags into the lower section of the structure to act as an accelerant. We are actively seeking input on best practices for this kind of burn, and welcome advice from Burning Man experts. In the morning and afternoon before the burn, all electrical components and lighting and any other non-burnable components will be removed from the Temple. During this time, we will cone off the perimeter for the safety of participants. Following this, any materials supporting the burn (such as cords of wood, hemp bags or other materials) will be loaded into the sculpture. A perimeter will be formed around the installation during preparation for burning. Pre-Burn, the inner perimeter will be supported by project staff, and we will request participation from Rangers and DPW as well in holding the perimeter. The Burn Perimeter will be formed one hour prior to the Burn. A safety kit and fire extinguishers will be on hand and we welcome the presence of Rangers and ESD staff on the inner burn perimeter. The LNT plan is a critical component of any playa-bound project. Ocean, who participates in Disorient as well as DPW, has participated in DPW Playa Restoration since 2007 and will contribute to the management of the Geodesic Temple LNT plan from setup to burndown. In 2008, 2009 and 2010, Disorient theme camp received a Green rating on the moop map, supported by the efforts of LNT leads FriarTuck, Tejawe, Ocean, and others. We have succeeded in leaving no trace for an Esplanade camp of 230 and will do so for the Geodesic Temple construction and camp as well. The setup phase is the most high risk phase for moop. This phase of the plan is designed in particular to avoid moop from wood chips and metal. Each aspect of the setup phase is addressed below. Workshop: The playa in the workshop area will be covered in drop-cloths/tarps to prevent as much as possible the dropping of metals (screws) and wood chips. The Workshop area will be mooped at the end of each day. Kitchen: The staff kitchen will be supported under a carport and will also include drop cloths/tarps to prevent kitchen moop. While the early arrival crew may also have the support of an RV with amenities and generator, the planning assumption is that a staff kitchen will exist and will also require an evap pond/holding tank, which will be evaped or pumped via a contractual arrangement with a service provider. Shade: A central shade will be constructed during the construction phase, over the workshop and in the communal area. The common shade areas will have drop-cloths or carpets to prevent moop from reaching the playa. Construction site: The actual site of the installation will be mooped at the end of each day and a metal rake will be used to pick up any screws. Any wood chips will be picked up. During the event, we expect that many will visit the Geodesic Temple and that any events occurring at the Geodesic Temple may result in moop by participants. The Geodesic Temple will have daily moop sweeps, spiraling out from the temple in a combined line sweep/free range technique. The goal is to moop anything left behind between sundown to sunset. The Geodesic Temple moop crew consists of at minimum 25 participants per shift. The participatory and interactive aspect of this activity is that visitors to the Geodesic Temple during this time will be encouraged to participate in the daily Scavenger Hunt for quality playa treasures and other moop. During the night of the Geodesic Temple burn, we expect that the burn participants may leave behind moop of all kinds. In order to assure that the perimeter surrounding the burn site is mooped, double the weekly number of moopers (50) will be coordinated to line sweep and free range fashion. Disorient will work with heavy machinery to scoop up the burned remains and DG. Contact 2011 at geodesictemple dot com to get involved. Wed 8: Deliver materials and tools to Governors Island. A silk scarf sporting several versions of the Temple. SOLD OUT. Sent: Feb. 1, 2011: File:Geodesic Temple BM2011ArtGrant.pdf, File:GeodesicTemple CityOfDreamsPavilion2011Grant.pdf, Figment Sculpture Garden.